Together with generally good weather and the rapid clearing of arable land, the new modes of farming improved crop yields, leading to rising population. During the high middle ages, Europe’s population doubled, from about 37 million to 74 million, with much of this increase concentrated in the North and West: modern Britain, France, the Netherlands, and Germany.1 The most productive medieval manors were the most specialized; they farmed the most productive crops most intensively. These manors, however, had to trade for everything they could not supply themselves, and required markets in which to sell their surplus. They needed towns. For this reason, although there were only 29 towns with more than 5000 inhabitants in Europe before 1000 CE, by 1200 there were 127.2 Towns generated wealth: they produced cloth, tools, glass and metal ware, furniture, and luxury goods; they provided markets for the sale of grain, fruit, and animals; and they housed butchers, brewers, and specialists of many kinds. 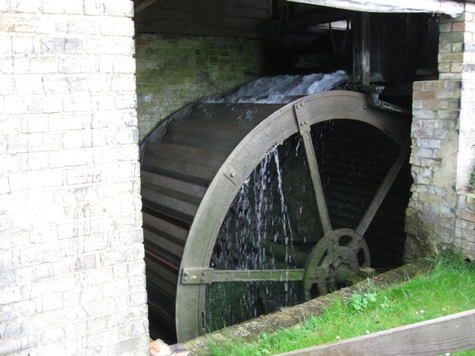 Like heavy plows and horse collars, however, it should be noted that watermills are similarly just one part of interrelated “technological complex.” To build an efficient overshot watermill requires a number of related skills: water must be channeled into a millpond, and then released through sluice gates into a downward running millrace so that the water pours over the top of a waterwheel providing rotary power. All of this activity can create a false impression of a “medieval industrial revolution.”8 The reality, however, was much more complex. Although in some places Europeans embraced new technologies and deployed them in innovative and sometimes spectacular ways, most did not or did so only seldom. The problem was that to deploy mill technologies on a large scale profitably required an unusual set of conditions: mills were expensive, so abundant capital was required, as was the presence of specialists to build, operate, and maintain the mills. Once built, mills needed plenty of raw materials—grain, , wood, stone, or whatever—to process, and they needed markets in which their products could be sold profitably. And, of course, they required ready and reliable supplies of wind and water. These conditions were found in a few French river valleys, in Northern Italy, and parts of the Low Countries, but seldom elsewhere. As Lucas remarks, the evidence indicates “those regions of medieval Europe that were engaged in industrial milling appear to have been geographical pockets of technological innovation within a broader environment of technological incrementalism.”9 This should not be seen as an insult to medieval Europeans, but as a reminder that we should be careful when thinking about historical change in terms of revolutions and breakthroughs: changes indeed are sometimes “revolutionary,” but far more often they are gradual and incremental. Water clocks, also known as clepsydra (water-thief), had been used since antiquity, and medieval Europeans had access to the fine description of their operation in the De architectura (On Architecture) of the Roman military engineer, Marcus Vitruvius (fl. 25 BCE).11 In this clock, water flowed at a controlled rate from a water source into a tank. As the water rose, it lifted a float, and this motion could be used to turn the dial of a clock face or release weights to ring bells. The Abbasid Caliph in Baghdad, Harun al-Rashid, had sent a very elaborate and elegant clepsydra as a gift to Charlemagne, complete with twelve mechanical horsemen that would ride out on the hour.12 We can imagine that the Frankish king was duly impressed, but simpler versions of these early alarm clocks seem to have been fairly common monastic conveniences.13 Yet water clocks had obvious disadvantages as well: they were inaccurate and fiddly; in the summer, the water in their tanks evaporated, and in the winter, it would freeze. A late fourteenth-century French astrolabe. To use the device, you would sight a star in the sky along the straight edge, measure its angle above the horizon, and then locate the star on the “rete” (the moving dial above the face). Engraved on the base plate are concentric circles denoting azimuth and altitude, forming a stereoscopic projection of the sky. When you rotate the “rete” dial until the star lines up with its position in the sky, you can read the time from a scale on the rim of the device. As in many similar cases, however, Europeans applied this inherited expertise to their own problems in new ways, and just as the camshaft enabled them to devise new uses for mills, the escapement proved the essential technological component of the mechanical clock. An escapement is a gear that restricts the rotation of another gear or shaft so that it moves only in certain well defined increments; sometimes a pendulum regulates the speed of rotation, but there are a number of alternatives. In all cases, it meant that hanging weights suspended from a cord wound about a shaft could be used to drive mechanical clocks, as could a coiled spring. 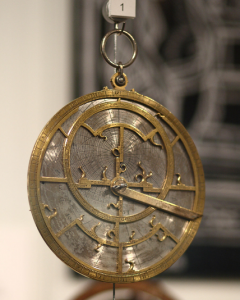 Who invented the first escapement is a mystery, but records of clocks probably using them begin to appear in Europe around the close of the thirteenth century. The Abbot Richard of Wallingford is shown here proudly presenting his astronomical clock to his monastery. This was a legitimate marvel of engineering, requiring extremely complex calculations to be performed mechanically through the timed intersection of meticulously crafted gears. It also illustrates how sometimes in history a very complicated invention precedes a simpler one. 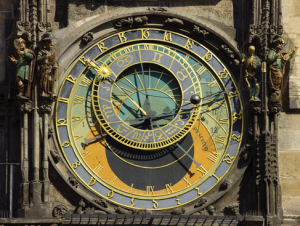 For, although astronomical clocks were of great value and interest to the church and its scholars, much simpler mechanical clocks, primarily used just to tell time, sprang up in European towns and cities almost immediately. The regular chiming of bells permitted, or perhaps better, required that people use time to regulate their lives. Now for the first time you could meet for lunch at one o’clock and reasonably expect your associates to be on time. Now the workday would run to ten or twelve equal hours, regardless of the time of year. More importantly, perhaps, the spread of clocks made time public and secular, and not under the control of the church. In later years, this understanding of secular time would play a pivotal role in the development of science, business, and urban society. 1 Moore, 30; Kay Slocum, Medieval Civilization (Belmont, CA: Thomas Wadsworth, 2005), 136. 3 William Thompson, The Emergence of the Global Political Economy (London: Routledge, 2000). 4Jean Gimpel, The Medieval Machine: The Industrial Revolution of the Middle Ages (New York: Penguin Books, 1977), 12-15. 5 Frances Gies and Joseph Gies, Cathedral, Forge, and Water-Wheel: Technology and Invention in the Middle Ages (New York: Harper Collins, 1994), 115-117; Arnold Pacey, The Maze of Ingenuity: Ideas and Idealism in the Development of Technology , 2nd ed. (Cambridge MA: MIT Press, 1992), 12. 6 Adam Robert Lucas, “Industrial Milling in the Ancient and Medieval Worlds: A Survey of the Evidence for an Industrial Revolution in Medieval Europe,” Technology and Culture 46.1 (2005): 1-30; 14. 7 Dyer, 299; Michael Pye, The Edge of the World: A Cultural History of the North Sea and the Transformation of Europe (New York: Pegasus Books, 2015), 258-260. 8 Lynn White, Medieval Technology and Social Change (London: 1968), 89; Gimpel expresses this argument even more forcefully: The Medieval Machine: The Industrial Revolution of the Middle Ages. 10 This and subsequent paragraphs are deeply indebted to John North’s terrific book, God’s Clockmaker: Richard of Wallingford and the Invention of Time (London: Continuum, 2005). 12 E.A. Truitt, Medieval Robots: Mechanism, Magic, Nature, and Art (Philadelphia: University of Pennsylvania Press, 2015), 21. 15 James Hannam, The Genesis of Science: How the Christian Middle Ages Launched the Scientific Revolution (Washington D.C.: Regnery, 2011), 21. 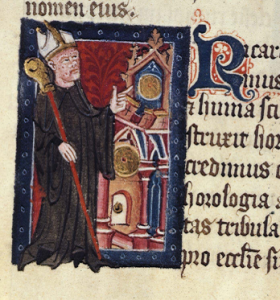 18 An idea explored in Jacques Le Goff, “Merchant’s Time and Church’s Time,” in Time, Work, and Culture in the Middle Ages, Arthur Goldhammer, trans. (Chicago: University of Chicago Press, 1982), 29-42.